As I start typing, it’s 9:18 AM Sunday. In 24 hours, we’ll be in the air, discovering how the boys do on a plane. I’m having a little trouble settling down to write a coherent sentence, so this will probably be disjointed, short, or both. Everything will be a lot more exciting starting tomorrow. I plan to post at least once a day while we’re gone, even if it’s just a picture of the boys. Yesterday, I helped host a Power of the Pen tournament at our local school district. Between that, prepping to pack, and wrapping up everything at work, the last few days have been a little hectic. Today is shaping up to be more full than I’d planned – my agenda involved resting, packing, and cleaning science experiments out of the back of the fridge. 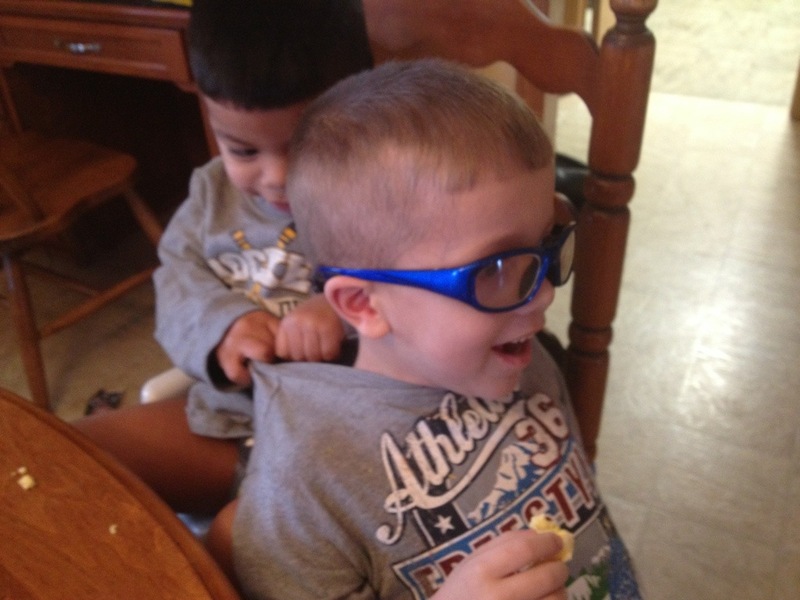 Paul took both boys to the barbershop yesterday, and all three of them got vacation haircuts. I think Levi may have lost a significant percentage of his body weight in hair. I probably let that go a little too long.